A lifting beam is a mechanical device that can be connected to a crane, hoist, or other lifting machine for the purposes of stabilisation of the load. Within lifting operations, a lifting beam is a mechanical device that can be connected to a crane, hoist, or other lifting machine for the purposes of stabilisation of the load. The design usually consists of a long beam with one attachment point on top and two or more lifting points underneath, although some specialised models can have two attachment points to engage with two cranes or hoists. Lifting beams supply multiple lifting points to a device that may only have one hook, and can be fitted with either variable or fixed lifting lugs. A similar tool to lifting beams is the spreader beam, which employs top rigging in the form of chain slings to stabilise the load even further, but it may require more headroom than a lifting beam. Industries that make use of lifting beams in the course of their lifting operations include a wide range of manufacturing sectors, mining, metalworking, lumber, construction, transportation, and marine services. The main reasons for using a lifting beam in combination with crane and rigging equipment are efficiency and safety. 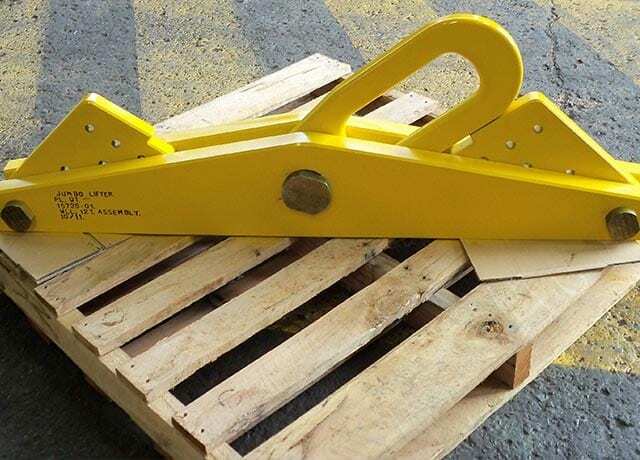 This tool enables effective handling of loads that may be out of balance because of their size, shape, flexibility (for instance, metal sheets or plates) or centre of gravity. Securing such a load through the correct type of lifting beam will almost always result in faster turnaround times as opposed to traditional rigging. Safety is another reason for converting to a custom lifting beam solution. Near-misses or, worse yet, rigging failures are never a pleasant experience and highlight the need for an expert to re-engineer the lifting setup at hand. The cost of accidents in terms of personnel health and operational downtime is just too high when moving heavy loads, and must be taken into account when choosing the appropriate lifting equipment for your business. Reliance Hexham are established professionals in the field of specialised lifting equipment. Our team of qualified engineers and technicians offers design, manufacture, refurbishment, testing and certification for lifting beams, including special and bespoke solutions in line with Australian Standards. We are fully integrated to take care of your project from A to Z: we see what we design, we test what we produce, and we know what works. Our lifting beams services are detailed below. For our other services within lifting, please consult our Specialised Lifting Equipment page. Our team of professionally qualified engineers are here to understand, evaluate, and design a solution specific to your needs, whether you are facing a simple replacement issue or an incredibly complex lifting challenge. Once a client approaches us with a problem they are facing, we proceed to scope out the work and develop a list of requirements and specifications to ensure we get it right the first time around. For example, we can design a custom lifting beam with an adjustable bail to re-balance the load. We then proceed to refine the design concept and develop an initial 3D model to give our customer a concrete idea of what the solution could look and operate like. We make use of the most up to date design software and apply our know-how to tackle the challenges your equipment will face during service. Our design goes through a series of internal checks to ensure it is delivered reviewed and verified. Once approved, we have the facilities to produce your customer-made solutions. To cite an example, one of our customers came to us looking for a specialised lifting beam suitable to lift 14 tonne diesel engines. Our team developed a unique frame that bolts onto the engine and in turn connects to the crane hook, a solution that increased efficiency and safety levels for our customer’s operations. Each item is manufactured in-house by our fully certified and trained staff. We strive to respect the highest safety standards using only the best quality materials, such as high-strength carbon steel. Carbon steel is exceptionally suited for lifting beams, being sturdy and reliable, yet ductile: rather than snapping, it will bend when overloaded, indicating the need for a replacement. 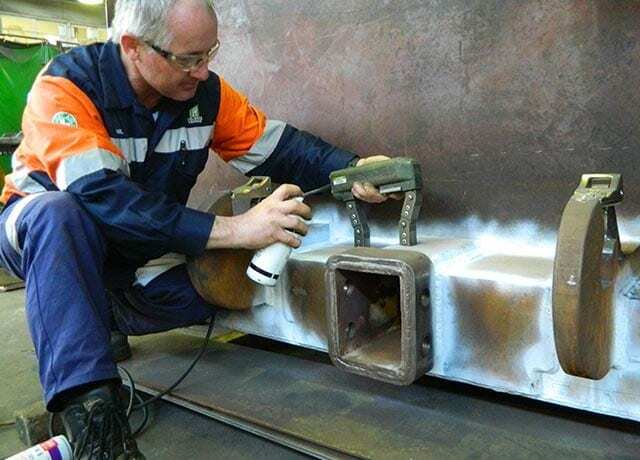 Finishing: on request – the product can be painted or treated to be spark resistant for marine lifting applications. We also produce a variety of compatible accessories such as shackles, hooks and chain slings. Reliance Hexham provides testing and certification services for new and in-service specialised lifting equipment, including lifting beams. Once tested, your equipment will be released with a full NATA certificate showing the working load limit, proof load value and compliance with all applicable Non-Destructive Tests. To find out more about our testing services, please visit the pages dedicated to Destructive Testing and Non-Destructive Testing . Reliance Hexham can overhaul, repair and recertify your existing lifting equipment ensuring it is 100% safe and fit for purpose. Our team of specialists will be able to provide dedicated advice for your specific lifting application and requirements and is always at your disposal for consultations or quotation requests.